Besides porridge (and to be frank, any other oat related food), granola is my next favourite breakfast food! After seeing so many delicious granola posts on instagram, I decided to make my own recipe. I decided to pan roast my granola as it’s quicker and more convenient that way. 1. Place nuts, sunflower kernels, apple, apple, oats and cinnamon in a pan on medium heat. Toast for about 5-10 mins or until granola has slightly browned and the apple slices have softened. Turn of heat and let granola coolled down. 2. 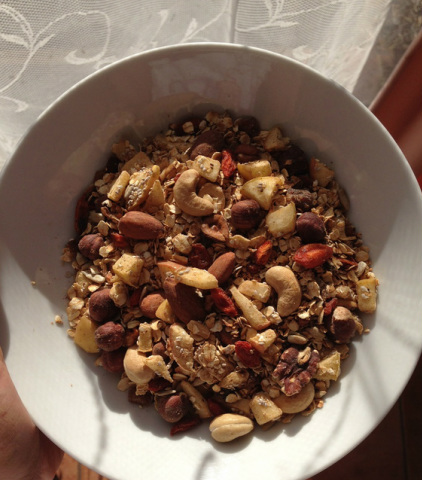 Once granola has cooled down, stir in dried fruit, chia seeds and goji berries into granola. Optional: most granola recipes usually have honey to sweeten it and sticks all the ingredients together (I personally don’t add it because I find it too sweet and it takes way the flavor from many ingredients), so if you want to add honey, just add 1 teaspoon if it whilst you are pan frying your ingredients. You can top your granola with additional fresh fruit for a refreshing boost!